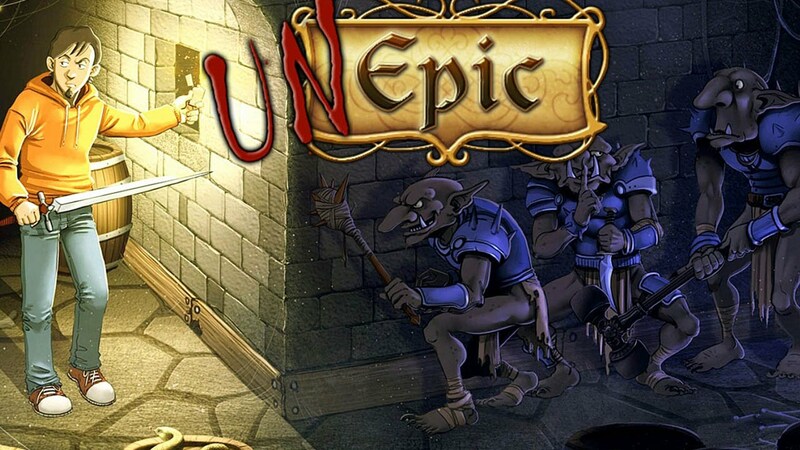 Unepic has the unique quality of reminding me of a game I’ve never played. 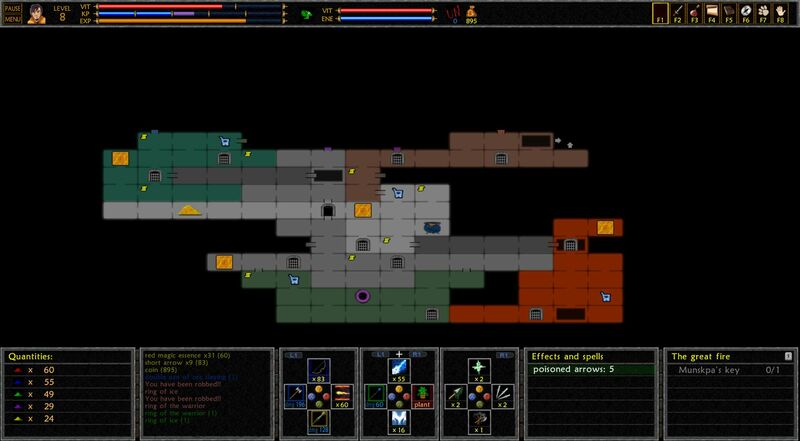 It feels like it utilizes a classic gameplay formula of meshing together elements of Metroid and Diablo in a 2D dungeon crawl, but I’d honestly never played a game quite like it. So while I lack any nostalgia for the gameplay, I found it inventive and interesting, despite some annoying difficulty spikes, immature, reference-filled writing, and a boring art style. As you can quickly surmise from the banner image, our snarky hero is a modern day 20-something transported into a fantasy dungeon. He spends the entire first half of the game convinced that he’s taken some hallucinogenic drugs, and constantly spouts not-so-clever nerd-culture references at every opportunity. It grows tiresome a few hours in, and this is a 20 hour game. The one saving grace with the trite story (besides the surprisingly great finale and ending) is the shadowy creature that possesses the hero early on. Dubbed Zera, the shadow fails to possess our hero (who probably has a name but I don’t remember it at all) and winds up trapped within his body, becoming an unwilling companion to our adventures in the castle. Zera provides a nice foil for our hero to play off of, as he’s constantly trying to get the hero killed so he’ll be freed. In one of the better nerd-references, their relationship is compared to X-Men‘s Xavier and Magento. Their respect for each other gradually builds over the course of the adventure, and by the end I grew to love Zera – murderous tendencies and all. While the story isn’t exactly as captivating as even the relatively simplistic tales in Castlevania or Metroid (or even Diablo), the gameplay makes up for it. 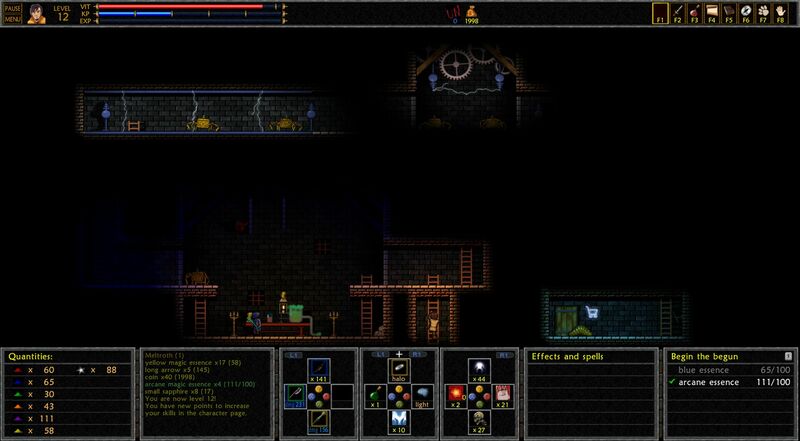 The dungeon is made up of individual rooms that take up a full screen. 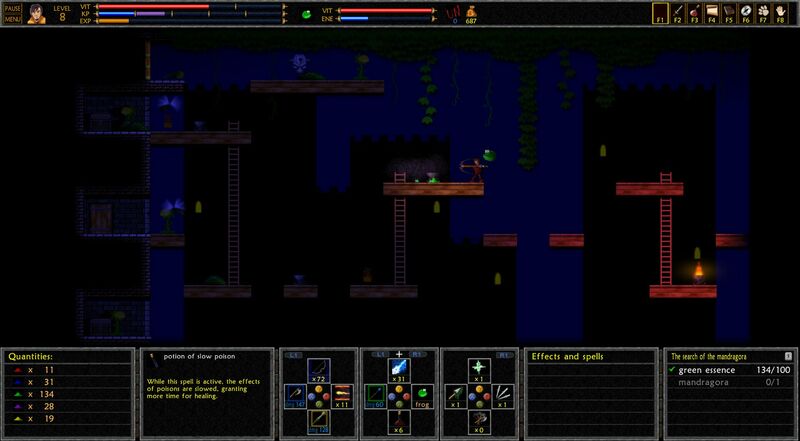 Each room is darkened and made up of multiple levels filled with ladders, platformes, and enemies. Lighting the torches along your way becomes critical, and a neat way to gauge your progress through each zone. The castle is divided up into over half a dozen areas, each with around a dozen screens, creating an impressively large dungeon. I actually found it just a bit too long as the overall gameplay and tactics grew repetitive toward the end – not to mention some rough patches where enemies grew wildly in strength and numbers. Damn the skeleton-filled catacombs! 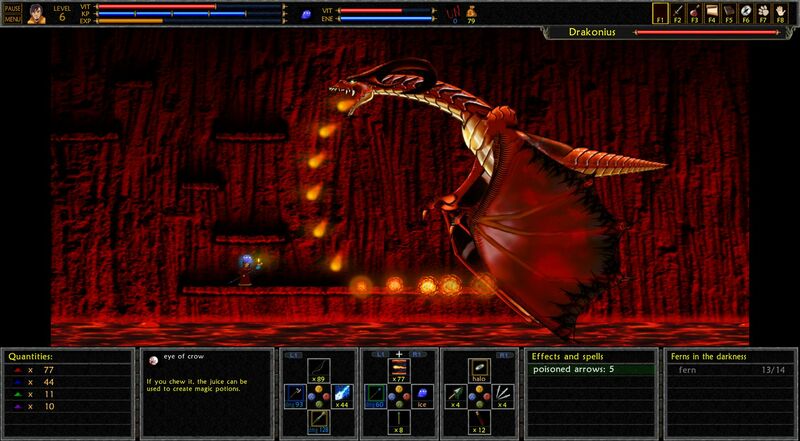 Unepic leans heavily on the RPG aspects of the genre. Leveling up awards 5 skill points that can be pumped into various weapon and magic skills. The system isn’t very user-friendly, and it’s designed for those that want to min/max their characters by dumping everything into only a few skills to get the best abilities and wield the strongest weapons. Of course you won’t know which skills and weapons you’ll want, so it’s a stressful bit of planning ahead in the early levels. There is a side quest about halfway through that allows you to reset your points – a very helpful feature. Each area has its own major quest that results in learning a new piece of magic. While some of the quests are fun and take you to different areas of the castle, it also leads to lots of backtracking. It also downplays the latter magic skills (Alteration, Protection) as presumably you’ve already put points into the early ones like Fire or Frost. By the way, I went with a rogue/ranger type build, focusing on daggers, bows, and axes. A unique dagger I earned from a side quest carried me far, but eventually dropped them to focus on bows and axes. I found a late-game unique bow that absolutely decimated everything, and became my weapon of choice, along with some support from Fire and Healing spells. Backtracking is alleviated with an admittedly great fast travel system. Especially coming from Ori and the Blind Forest, which didn’t have one at all. Gates are scattered around the castle, usually 2 per zone, and teleport you to a central room filled with other gates. In addition you can buy scrolls and spells that instantly take you to the merchants in each area. Quickly moving around the relatively large dungeon wasn’t an issue at all, though trying to remember which merchants sold what ability tomes was a bit annoying. Limited animations and pixelated graphics are more than fine for a one-person indie project, but I was disappointed at the very limited palette selection throughout most of the castle. The individual room designs are nice, but so much of the castle is brown and gray that it grows repetitive after a dozen hours. Enemy types are also repeated to a high degree, with skeletons, snakes, and goblins making up a bulk of the foes I killed. Bosses fare a little better, taking a cue from the large, area-defining bosses of other metroidvanias. Oddly enough despite my haphazard skill management and character planning, I found most of the bosses quite easy. Zera helpfully warned me about each one, and most were slow with easily dodged attacks. With better writing and a tighter, more varied focus Unepic could’ve been something really special. It’s still an impressive collection of genre parts all working together to produce a fun experience. By the final few areas I was definitely ready for it to be over, though I did very much enjoy the twist ending and interesting gameplay mode they introduce for the final battle. An interesting indie RPG experience that rewards persistence, exploration, and careful character planning. 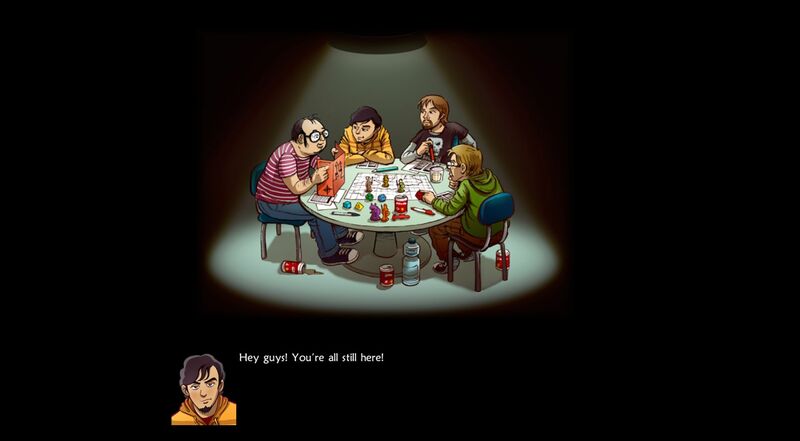 Final Say: An interesting 2D action-platformer-RPG with a few too many problems that keep it from indie greatness.